Not sure how that’s going to work out. We’ll see. Pavement, isn’t it? Buy yourself a beer. I wish I had the guts to chop my hair…I don’t know how Donna didn’t have post-partum. I say go for it! The style in the pic will be fun as long as you don’t have a cowlick (like I do). Otherwise, side bangs are always a great look too. oh my, do the do!!! and you are coloring it purple, right? Pavement it is! Now, tell the truth: did you google it? 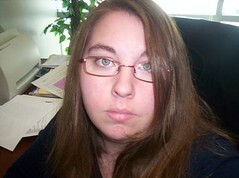 I tried to go with bangs once, but I have a cowlick something awful. This still makes me a sad kitty, on occasion.